If he didn’t get caught, he’s been accused of it. The top Google Instant search terms for “Carlos Mencia” are “Carlos Mencia steals” and “Carlos Mencia steals jokes.” This guy has enemies. L’Affaire Mencia is important to academics and post academics because, on top of all their other duties, professors must be diligent about catching lazy students … and even then the schools don’t have the teachers’ backs. In the latest depressing plagiarism-related episode, about 600 students at the University of Central Florida got caught cheating on a test in a business class. Whether you can catch students in the act or not, it is worth noting that these student cheaters will become hamster-world cheaters. Enter Carlos Mencia. Mencia allegedly stole jokes from several comedians–including the Cos! More after the jump! 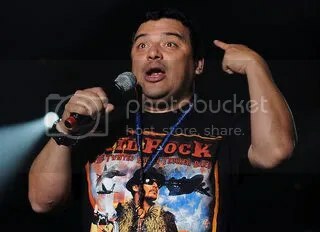 Comedian Carlos Mencia performs during the Tour for the Troops concert at Incirlik Air Base, Turkey, December 1st, 2009. Photo by Sara Csurilla, U.S. Air Force. Image from Wikimedia Commons, federal image, public domain. Now, I am not a comedy expert, and I know that comedy is a fiercely competitive enterprise. Someone may have had a grudge against Mencia for another reason, and Mencia might have trouble separating his thoughts from his unconscious clutter. But the scrutiny of his act suggests that plagiarists always get caught, and it’s proof that even a whiff of plagiarism can destroy a career. The comedy community is doling out its punishment by deeming Mencia persona non grata. The chief reason Mencia comes up as comedy’s plagiarism poster boy is that the accusations keep popping up. Even if a TA or a professor can’t bust a plagiarist, it’s a teacher’s job to make clear that students need to do their best to distance themselves from cheating, or even an accusation of cheating. A person can make a mistake, but a persistent, flagrant cheater will eventually get caught and will suffer the consequences. So I offer Mencia’s story to show that, if you can’t stop a plagiarist while he or she is cheating in college, don’t worry. His boss will catch him, or his peers will catch him, and he’ll wish that you stopped him before he dug himself into a deep, deep hole. Subscribe to comments with RSS	or TrackBack to 'The Mencia Effect: Or, Proof That People Still Take Plagiarism Seriously'. Good point. Comics are pretty forgiving about joke overlap, as that’s the nature of the biz, but when you start stealing whole routines, it gets pretty ugly. Unfortunately, I often wonder if students notice the difference…but it’s true that if you get caught, infamy follows!